This trap will enable your Waste King disposal unit to be connected quickly and in a very sturdy way to your existing waste outlet T junction. McAlpine are the market leaders in plastic plumbing traps, were the first UK manufacturers of such traps and are still considered the best available today.This trap has a patented seal and inner tube system which means it can fit both 40mm and 1 1/2″ pipes. 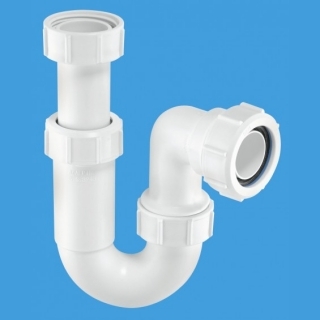 The vertical pipe attaches onto the 90 degree elbow outlet of the Waste King and provides vertical movement for easy positioning when attaching to the existing T which is underneath the main bowl. All that is needed is a short length of pipe (4-6 inches but just cut to fit) to connect in to the T and job done!